The unmanned Russian Progress 37 cargo craft atop its Soyuz rocket launches from the Baikonur Cosmodrome in Kazakhstan on April 28, 2010 to deliver new supplies to the International Space Station. Full Story. A Russian rocket carrying a new unmanned cargo ship liftedoff Wednesday with tons of fresh food and supplies for astronauts aboard theInternational Space Station. 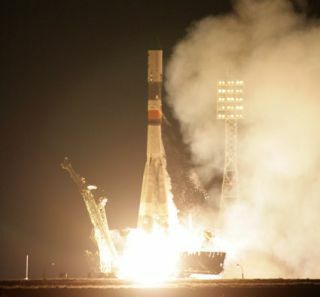 The Soyuz rocket blasted off at 12:15 p.m. EDT (1615 GMT)from the Central Asian spaceport of Baikonur Cosmodrome in Kazakhstan carryingthe robotic Russian-built space freighter Progress 37. The cargo ship is due toarrive at the orbiting laboratory Saturday afternoon. Tucked aboard Progress 37 are 2.6 tons (2,359 kg) of freshfood, science equipment and other supplies for the six astronauts living aboardthe nearly complete International Space Station. The spacecraft is due to dockat the station's Earth-facing Pirs docking port on Saturday at 2:35 p.m. EDT(1835 GMT). NASA officials said Progress 37 is hauling 1,918 pounds (870kg) of propellant, 110 pounds (50 kg) of oxygen and air, 220 pounds (100 kg) ofwater, and about 3,301 pounds (1,497 kg) of experiment hardware and spare parts. The spacecraft is also carrying some special care packagesfor the space station crew. Candy, books, and new movies are just some of thefun items making the extra-special delivery, according to Russian news reports. The space station is currently hometo six people ? its full population. The crew includes two Russians, twoAmericans and a Japanese astronaut. Veteran Russian cosmonaut Oleg Kotovcommands the group. Russia's Federal Space Agency (Roscosmos) regularly launchesunmanned Progress cargo ships to resupply the station crew. Progress 37, known toRussians as M-05M, is the 37th such ship to head toward the space station,which has been under construction since 1998. Progress vehicles resemble the three-module Soyuz spacecraftbuilt to ferry astronauts and cosmonauts to and from the space station, butinstead of a crew capsule at their center, the unmanned versions carry a roundpod packed with fuel for the space station. Progress spacecraft can also autonomously fly themselves tothe space station and dock at one of its four Russian parking spots, though cosmonautsdo monitor their approach and can take remote control from inside the stationif something goes wrong. After several months at the space station, the Progressvehicles are jettisoned to make room for more spacecraft carrying supplies orastronauts. Last week, the automated Progress 35 spacecraft ? whichlaunched in October 2009 ? undocked from the space station. After remaining inorbit for several days to perform science experiments, the spacecraft fired itsengine Tuesday to intentionally destroy itself by burning up during re-entryover the Pacific Ocean. The space station astronauts are preparing for a busy monthahead. NASA plans to launch the spaceshuttle Atlantis on its last-ever spaceflight to deliver a new Russianmodule for the $100 billion space station. Liftoff of Atlantis is currently targeted for May 14 fromNASA's Kennedy Space Center in Florida.